Edward Burtynsky’s The Industrial Sublime, now up at Weber State University’s Mary Elizabeth Dee Shaw Gallery through November 22nd, was reviewed in the September 2011 edition of 15 Bytes. 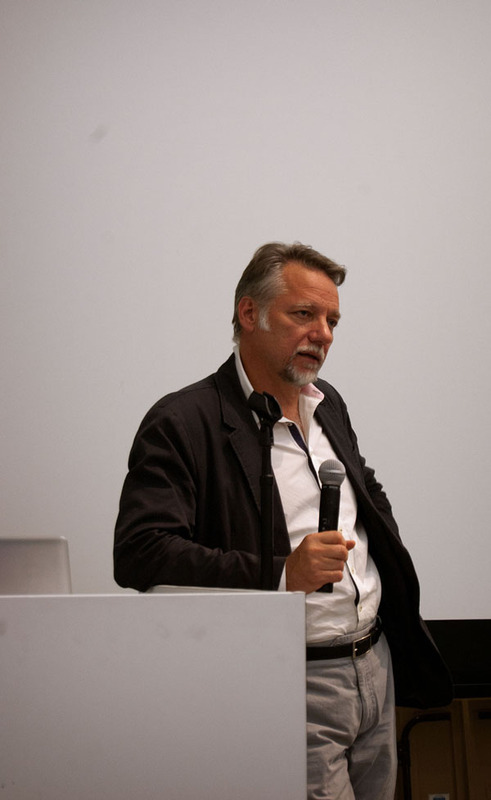 Earlier this month Burtynsky came to Weber State University, and before giving his artistic talk Hikmet Sidney Loe sat down to talk to him about his work. Hikmet Sidney Loe (HSL): I wanted to follow up on the three wishes you posited during your 2005 TED Prize acceptance speech. Did any of the wishes come true? One wish was for an IMAX movie; did you get to make one? Edward Burtynsky (EB): No, I didn’t end up making the IMAX movie, but I did end up making the film Manufactured Landscapes with Jennifer Baichwal. In an interesting way it had a broader audience than I think even an IMAX movie would have had, but it wasn’t ultimate in working in the large format of film. I delved into making an IMAX film and spent a year, and a lot of people came up to help, but it’s a tough thing to make happen. It’s a big camera…I was trying to mount it on the nose of a helicopter in very remote industrial spaces. We were looking at a budget of over $7 million dollars, there was no guarantee of distribution, and every IMAX theatre had their own choice of relationships cultivated with major institutions, so I just looked at the whole thing and thought, no. That being said, I was just approached by some people making IMAX films but that’s easier said than done. 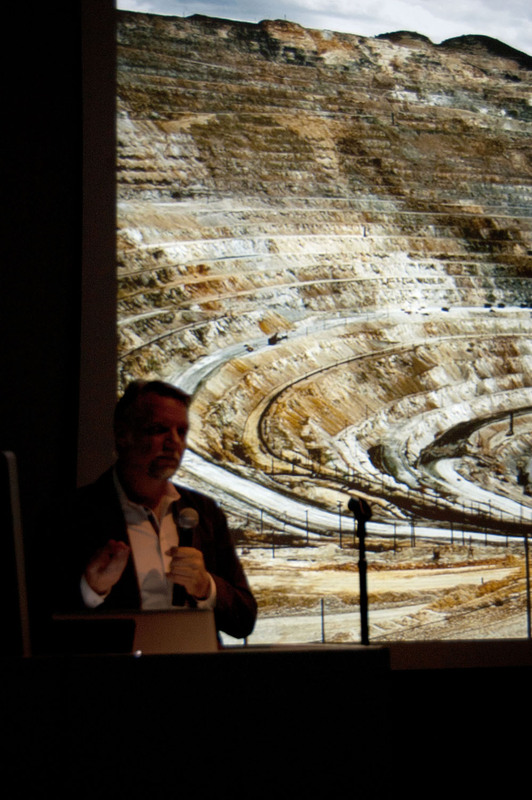 HSL: How was the content of the Weber State University show [Edward Burtynsky: The Industrial Sublime] chosen, did you have a hand in that? EB: No, I have someone in my studio who works with me, Marcus, who works with media and museums. I’ve known Marcus for 35 years…he’s worked with me for 8 years…we went to school together. He’s like an extension of me. That allows me to concentrate on: what am I doing next, where am I going next, what am I shooting next. So, I’m always in that front end of development. Working with all those things is almost a full time job; I didn’t want to have that distraction while I try to make new work. HSL: What’s next? What are you working on that’s coming up? EB: I did the Oil show and it’s still circulating through the United States, Canada, and Europe. I’m thinking that “water” is another subject that I felt how we as humans shape landscape in pursuit of water. So, that’s something I’ve been working on for three years. I’ve just had some images published in National Geographic (“Plumbing California” 2010). I started researching it in 2008, shot in 2009, and published in 2010. I was already moving in that direction when I received the call from National Geographic, so I said sure. HSL: How many people do you usually work with? EB: Minimum I can be down to two, then go all the way up to seven or eight. When the film was following me around, there were 15 people around. HSL: Is there a body of work you would like to revisit? Or do you feel that the work you’ve done is in the past? EB: I have an idea of doing something with mining again that I haven’t done. I’m finished with quarries, but there’s something with mining that I’m still working through. I don’t feel like I’ve had the last image on that one yet. I’m doing a project on agriculture. I worked early on in my career, 1981, 1982 I was doing a whole series on “Animal Husbandry.” Photographing industrial chicken, pork farms, cattle…I’ve touched on it, did a bit of work on it, but never brought it to any kind of completion. That’s a subject I find…but it’s a very sensitive one, I’m not sure what my chances are of getting that one done. HSL: Have you been back to Bingham Copper Pit to photograph it? EB: I have been back to Bingham and photographed it from a helicopter, but it was a bloody cold day and my whole camera seized up. It was so cold it was like 20 below Celsius [-4 F]. I think I ended up squeezing off about fifteen shots then it died. I had all the expense of getting a chopper above it then turned around to go back and just thaw! HSL: Is there a site you would like to revisit? EB: There are places I haven’t gotten to the extent I’d like to; as I said, in the world of mining, there are a couple things I’d like to revisit. I think it would be interesting to revisit Bingham, it was one of my first successful mining pictures. HSL: Which body of work was the most physically challenging to work on? EB: Well Bangladesh, and the ship breaking work was ridiculously challenging. The air was really bad; half way through the shoot I got sick; I usually don’t get sick on my shoots. I was down for three days flat on my back during a very important shoot. It was very stressful, and dirty, and hot, and like going back to [Charles] Dickens looking at and the satanic mills or something. HSL: You have mentioned Caspar David Friedrich as an artist whose work inspired you. Are there other artists in the same vein of the sublime who have inspired you? EB: Sure. The landscape photographer Carleton Watkins is one. I saw a show of his with the 18×22 “Mammoth Plate” images of the American West. His inspiration [to me] was not only the incredible craftsmanship at the time, but the absolute insanity of the difficulty of what he was trying to do. Understanding what these photographers were doing in coating their glass plates in the field and building the roads to actually get there. Whenever I complain about lugging an 8×10 I have to remind myself “this is nothing.” I carry coated sheet film in my backpack, by myself, and it just kind of gave me a lesson in, “don’t be a wuss!” Some of those early guys, such as Samuel Bourne, were just incredible. He did work in India that was just awesome; he did crazy stuff with glaciers. So, what the nineteenth century pioneers did was something very direct, honest, observational work. It wasn’t full of mannerisms, it wasn’t trying to be anything it was just responding to that thing in front of the camera, in what I felt to be a very honest and profound way. Friedrich, the painter, was also that kind of [artist], particularly in those ice field pictures, the ships were blocked in ice. Us dwarfed by the forces of nature, to me, that was the scale he played with. The notion that nature is a dominant force was an interesting, romantic point of view at that time. HSL: Do you consider your work to be related to the New Topographics photography movement, or to the work of photographers Bernd and Hilla Becher, or Andreas Gursky? EB: When I was going through school in 1976, there was a show of the New Topographics that we were made aware of. I saw the book at that time [William Jenkins, New Topographics: Photographs of a Man-Altered Landscape. Rochester, NY: International Museum of Photography at the George Eastman House, 1975], we discussed the work at school. I found it really interesting…I was always interested in the landscape. As a kid growing up, and being in Canada, as you know, there’s a pretty small population with a mighty big chunk of land, so I got into the experience. That experience of what I call the pristine, or raw landscape, the one we haven’t really gone in or intervened in, or stomped all over, it’s interesting because I recognize not all people have had the experience to be out there in that space, or to fully understand what it is that nature delivers without our intervention. It’s like, what is this planet when we don’t mess with it? What does its surface look like? To me it’s a really important reference point…I’m not sure I could have made all this work without understanding that reference point of what it is before we intervene. HSL: In Manufactured Landscapes, your work exposes the viewer to industrialization through interior workspaces that are as vast as landscapes, and exterior landscapes that have been reworked for manufacturing. Do you think we live in an era where people aren’t aware of the difference between interior and exterior spaces? Are people losing the idea that nature is available for something other than extraction industries? EB: Oh, people don’t even think about the “other landscape” maybe we’ve become so urban that nature is kind of a sideshow, a little thing out there, it isn’t relevant to survival in the urban jungle. Some people go out there to hike in nature, to enjoy that experience of being in the fresh air and exercise, but I don’t think a lot of people think about that place as necessary for our survival. Or, they don’t think that diminishing that world creates an unbalance that may come back and affect our more synthetic world. But it does. If we do something that kills all the frogs off, or kills off whatever, if we think that won’t work up the food chain and compromise the health of the general environment, we’re just really in denial of what nature is and how it’s all interconnected. If we remove a component, if one component is taken out, it doesn’t stop there. HSL: Because of the nature of your photographs, and the knowledge you have of the environment, is there a way that you don’t feel defeated by that knowledge? EB: It seems from doing all the work I’ve done…there are many people who are out there trying to ring the alarm bells to bring awareness to the fact that we’re clearly outside of a sustainable envelope; it’s not something we can do indefinitely. There will be a day of reckoning. Should we be at all concerned about postponing that day of reckoning, or, try to avoid that day of reckoning? Currently I don’t see very much effort in either of those two camps. In fact, lately it’s been very disheartening to hear: “Let’s get rid of the EPA!” What?? “That’s a frill.” That’s not a frill!! It’s clear that voice is being pushed back [Al Gore on climate change]. It’s not unusual that in a period of economic contraction the environment is sidelined because everybody is more worried about jobs, and more worried about families and losing their homes. Clearly, you can’t really argue too much about that, when people are suffering at that level. It’s understandable. But it still doesn’t justify rolling back. If one looks back at the intentions the EPA put forward: all the citizenry of the country are entitled to clean air, clean water, and food that they can eat, why would that change? Why does the right think it’s not good for them to have clean water, clean air, and good food? They die the same way we do, so I don’t get it! Unless their belief system is in denial. Cognitive dissonance. HSL: Do you still find aesthetic beauty in landscapes, or does the knowledge of extraction – all of these systems we have overlaid onto the landscape – taint its beauty for you? HSL: Can you give us an example? EB: So, the Breezewood photograph [Breezewood, Pennsylvania, USA 2008], by the time I figured out that photograph, it took me over two days. With the point of, I tried to photograph it every which way to Sunday. I rented a 4WD, I rented a 40-foot scissor lift, I was driving all over the place. Ultimately, I had to find a place where I could park that thing and have 40 feet of height, was the range of possibilities I had to photograph. I spent two days driving up and down, trying different places, going over here, going over there. Finally, after about a whole day of looking, I finally choose my spot. I then recognized the time of day it would be best to shoot it. I went back to set up and just sat in that one place and waited for two hours to watch the light. I chose one picture from that. So, that’s three days to make one picture. I did another picture of the Sturgess motorcycle rally [Downtown Sturgis, South Dakota. USA, 2008]…that took me three years to figure out how to make that picture! It took me three years of negotiating to make a picture like that. These aren’t chance happenings, they’re very…to me the hardest thing is to decide: what is the picture? That’s the heavy-duty work; that’s the hardest choice. Of all the things I could photograph in the world, what do I choose to photograph? The tyranny of choice! HSL: In Manufactured Landscapes, you say you had an “oil epiphany” while driving in 1997: the fuel and car’s components were based upon the oil industry. You called “oil” the key building block of the past century. What do you envision is the key building block of the century we inhabit? Is that water? Or are we still on oil, will it always be oil? EB: No, it can’t always be oil, because we’ll run out of it! Water is a necessity of life, so if we run out of it, we’re really skunked. The thing about oil for those who have been looking at things long enough: peak oil is not a question of if [we run out] it’s a question of when. Although, I think people don’t want to really think about that. If the question is when, then are we in it? Is it going to happen in five years, are we in it? Is it going to happen in ten years? There are different peak oils; there’s peak oil at $100/barrel, there’s peak oil at $200/barrel…some people refer to the price of oil as playing ping-pong on a moving train; the thing’s going back and forth but the price is going up. And that’s eventually what’s going to happen to oil – it is! – it’s going up and up. When the energy it takes to get the oil out is equal to the energy you put in, you’re done: you’re taking more oil out to feed the machine to take the oil out, so nobody gets any oil. Then, I believe there are seven billion of us here because of oil. To me it’s become very clear that this was at the core of everything, and there isn’t an easy replacement. Let’s say we can find an alternative to oil energy: let’s say it’s sun…batteries. There is a whole bunch of other things that oil…molecular strings of oil is doing, from plastics, to oils, pharmaceuticals, agriculture, paints, it’s everything. You start looking at how it’s used in all the other industries. Or, when we’re driving, we’re driving on black top…we’re driving on oil! We’re using oil to drive on oil, so my epiphany was: it’s everywhere, and once oil starts to dial back, are we prepared? I don’t think we’re prepared at all! I believe there are technological answers that are pretty significant, so that possibly we’ll be able to build all this stuff out of nanotechnology so that it can be structured to whatever we want. I don’t think we’re that far from doing that. There are alternative energies that are on the cusp of breaking through and becoming viable, but nothing’s as easy and cheap as pumping it out of the ground. As long as it’s easy and cheap, we’re not going to re-invest in the next generation of stuff…until it’s no longer easy and cheap. 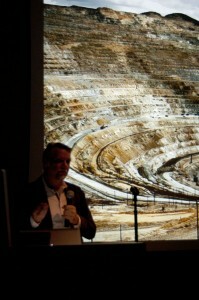 Postscript: Burtynsky’s public talk in the Department of Visual Arts (Weber State University) followed this interview. 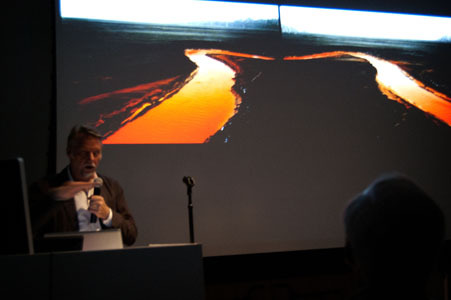 He spoke for over an hour, presenting many photographs not included in the current exhibition “The Industrial Sublime.” Highlights included early photographs of pristine landscapes and several images from the “Rail Cut” series (landscapes horizontally divided by railroad lines; the upper landscape was untouched by human intervention when the lower landscape under the railroad line was disrupted). Burtynsky also showed new work from his next series, “Water” in his continuing, investigation into how we have transformed our planet through infrastructure and industrial redirection. Images span the globe, from Owens Lake and the Salton Sea in California (showing their dearth of water), to the Gulf of Mexico during the BP oil spill of 2010, to 12th century water wells in India, and contemporary farms lands in Spain. Watch for an upcoming book on the “Water” series, and Burtynsky’s next film.